This is a synopsis of a talk and mini-workshop I gave recently in Vancouver. 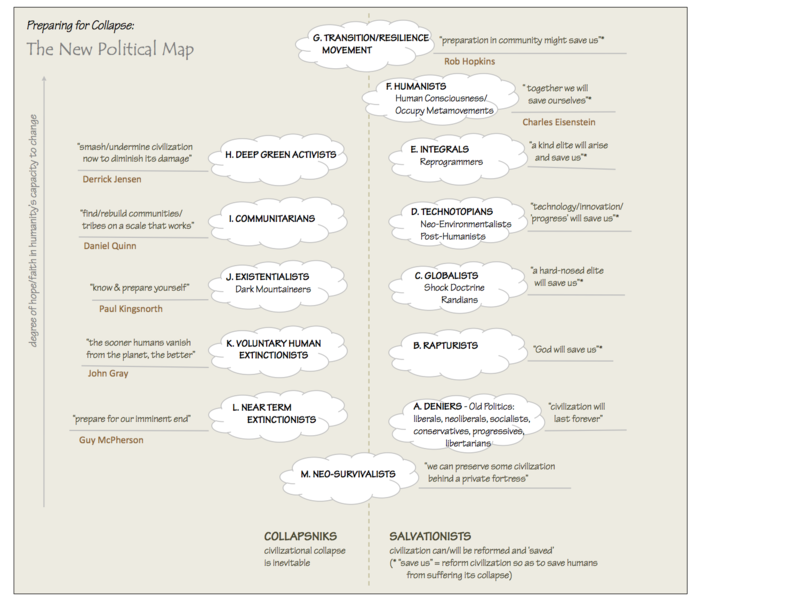 It introduces a model for identifying and dealing with both the complicated and complex aspects of issues we face in our own lives, in our organizations and in the world, and presents an elementary method of thinking about and diagramming systems (both complicated and complex) as a means of better understanding and appreciating them. The book I recommend for studying the nature of complex systems and how to think about and diagram systems is Rosalind Armson’s Growing Wings on the Way: Systems Thinking for Messy Situations. If you buy the Kindle edition, you’ll find the illustrations unreadable, but you can download and print them in legible format free from her website. Examples of messy situations might include: the healthcare system in your country, dealing with a family break-up, exploring change and making it happen in your organisation, and worrying about how to look after your elderly parents. [Other examples include coping with poverty, addiction, inequality, a fragile economy, and runaway climate change]. Complex systems: organic systems, such as the human body, organizations, cultures and ecosystems, which are not fully knowable, have an infinite number of variables affecting them, and cannot be understood with sufficient precision to assess causality with any certainty or to predict the outcome of interventions reliably. Studying complex systems and issues will allow you to appreciate them (see why they are the way they are, how they probably got that way, and what keeps them going), but you can never fully understand them. Many of the issues we deal with in our lives involve both complicated and complex systems, and hence have both complicated and complex aspects that need to be teased apart. I use the terms ‘problem’ and ‘solution’ in dealing with the complicated elements, and the terms ‘predicament’ and ‘approach to addressing’ in dealing with the complex elements, since predicaments by definition cannot be ‘solved’ or ‘fixed’. The approaches to addressing them often entail accepting and working around them, or adapting to them. Trying to intervene to change them in a desired direction is usually ineffective and can often lead to paradoxical results that make the situation worse. Pollard’s Law of Complexity: Things are the way they are for a reason. If you want to change something, it helps to know that reason. If that reason is complex, success in changing it is unlikely, and adapting to it is probably a better strategy. The left side of the model describes the steps involved in dealing with a complicated problem (or the complicated aspects of an issue with both complicated and complex components). If my car won’t start, for example, this model would instruct me to, first, analyze the situation (what are the possible reasons for it not starting, how do I diagnose the problem by testing each possible reason etc. ), by imagining what might be wrong, questioning why and how it failed to start and whether each possible diagnosis makes sense, and conversing with others who might have useful insight or experience with the problem. From this, I can understand the situation and deduce the most logical causes of the problem and the appropriate solution to each possible cause. And finally, through collaboration with others, and through accepting offers from people who know and care about the issue, I can intervene ‘systematically’, until the right solution is pinpointed and my car starts again. It may be an iterative process, but it is not a complex one. There are only so many variables, causes, and things that can have gone wrong, and there are only so many ways to rectify the mechanical malfunction. The right side of the model, by contrast, describes the steps involved in dealing with a complex predicament (or the complex aspects of an issue with both complicated and complex components). As an example, I suffer from a chronic disease called ulcerative colitis. Although the incidence of the disease is soaring and globally it seems to correlate closely with affluence and stress, its causes are unknown (and, despite medicine’s hubristic claims, probably never will be known), so we can only treat the symptoms. Unlike my car problem, I can’t analyze and understand the possible causes and ‘fix’ the problem. All I can do is explore what is known about the symptoms, and the hypotheses about how some treatments appear to alleviate symptoms in different sufferers, and appreciate the complexity of the predicament and the options available to me. Then, by imagining what might have happened to make me vulnerable to this disease (e.g. taking high doses of oral tetracycline as an acne treatment in my teenage years), questioning theories and options (e.g. will taking a ‘maintenance dose’ of an anti-inflammatory help or hinder), and having conversations with people who have studied the disease and people who know my lifestyle, and by rigorously tracking correlations between my diet and lifestyle and my feelings of well-being (something I’ve been doing since it was first diagnosed), I can begin to make sense of its sudden occurrence in 2006 (after I received some extremely stressful news), and its non-recurrence since then (except for two mild flare-ups in 2007 and 2013). And then, by collaborating with and accepting offers from others (e.g. acknowledging the wisdom of my GP’s recommendation to immediately quit my high-stress job, discussing my situation with other sufferers and seeing how they have dealt with it, and accepting a low-stress job that came to me most fortuitously late in 2006) I can adapt my diet, exercise regime, work life and other aspects of my lifestyle to try to reduce the risk of flare-ups and work around this disease that will be with me the rest of my life. First, the issue at hand must be separated into its complicated and complex aspects. One of the complicated aspects might be poor IT systems that don’t provide a means to capture and disseminate what people know and have learned. Two of the complex aspects might be cynicism that useful knowledge can be ‘captured’ at all in a database that lacks context of the situation, and a performance assessment system that rewards individual achievement and provides no incentive for sharing or collaboration. The complicated aspects of the issue are then addressed using the analyze to understand / imagine, question, converse / deduce / collaborate, offer / intervene process. Why don’t the existing IT systems have a mechanism to capture knowledge? What is the most useful knowledge to capture and what are the options for structuring it so that entering it into the system is easy? How does this new database fit with existing IT architecture and how might it most effectively be accessed? What technical problems does this present? Who do we need to talk with to understand how this will be used, updated and maintained, and whose ‘job’ will it be? Who will we need to promote this new resource, and how will this be done? Who has real passion for testing this, and whose collaboration will we need? It’s not simple, but it’s not a complex process. It should not be hard to deal with these ‘merely complicated’ aspects of the issue. 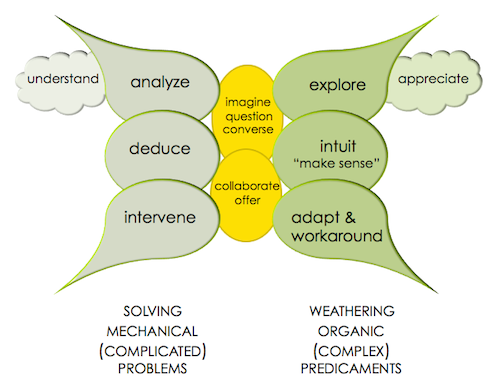 The complex aspects of the issue are more perplexing; they need to be addressed using the explore to appreciate / imagine, question, converse / intuit & ‘make sense’ / collaborate, offer / adapt & workaround process. Why aren’t people explicitly sharing knowledge already? The exploration might reveal that knowledge is already being shared generously, through mostly-informal iterative context-rich conversations. Then what? Should we tell the boss that trying to capture this in databases might seem to be efficient but is actually very ineffective? How might we, instead, enable and encourage more such conversations? Is it fruitful, and practical, to try to record and ‘reuse’ such conversations? The exploration might help us appreciate that most of these conversations are based around stories that don’t lend themselves to capture in rigid data entry formats. How might we then capture and organize stories in a way that would be useful, or can we do so at all? Rather than capturing stories, should we be training our people how to be better story-tellers? How do we deal with the fact that we grade performance individually on the curve, which necessarily provides a disincentive for collaborating and helping others improve their performance? How do we ‘make sense’ of the fact our people collaborate and share generously despite this disincentive? As you can see, this is a very different process than the one that worked for the complicated aspects. It generally leaves us with a greater appreciation of why things are the way they are, and how people have worked around the existing formal processes to do their jobs as well as they do. It can be a pretty humbling process, one that leads more to actions around “how can we help you do what you already do more easily and effectively” than “how can we get you to change your behaviour”. It’s no surprise that, for many organizations that have tried to introduce a ‘knowledge-sharing’ culture, the job quickly focused on the easier merely-complicated aspects — it became all about IT, and in fact many people began to see Knowledge Management as being just an aspect of IT (all about content and collection). No one really wants to deal with the complex aspects (having the hundreds of challenging conversations necessary to appreciate the status quo and the very human motivations behind it, and helping people in modest ways to do their best work better) because this work is hard and thankless and difficult to measure meaningfully. Because of that, and the lack of insight, imagination and courage by executives in charge of such ‘culture change’ programs, most such programs, in my experience, fail. It requires a very different skill set to deal with the complex aspects, a skill set that in most organizations is in short supply, and is much underrated by the mostly-analytical left-brained thinkers who make the final decisions. Sadly, the only truly successful large-scale culture change programs I have seen entailed the firing of a large proportion of the staff and the hiring of new people who already embodied the desired ‘new’ culture. For the same reason, many organizational ‘consolidations’ and ‘mergers’ (takeovers), both in the private and public sector, end up with almost all of the acquired organization’s people leaving. This incapacity is equally true, unfortunately, in our attempts to deal with complex predicaments like poverty, inequality, our fragile economic system, the exhaustion of cheap energy, and runaway climate change, in our larger society. And in this larger society there is no one ‘in charge’ to make the decisions that would be needed to bring about large-scale imaginative adaptation to the challenges we face. So we’re left to deal with such predicaments personally, and in communities that are sufficiently small-scale and sufficiently enlightened to appreciate both the predicaments and how imaginative adaptations and workarounds can alleviate their pain and their harm, at least locally. Most people don’t want to hear or believe this; they want to believe there are miraculous ‘fixes’ to these now-global predicaments. But the more you study complex systems, the more you realize there are none. Geoengineering proposals now being made to ‘fix’ our atmosphere are a classic case of trying to ‘solve’ a complex predicament as if it were a merely complicated problem, and its outcome will almost surely be disastrous. These diagrams are used differently in complicated vs complex systems. In complicated systems, they can be used to analyze, understand, predict, and intervene optimally. In complex systems, many of the benefits of diagramming emerge from the process of diagramming rather than the finished diagram, i.e. from the exploration and appreciation of the predicament. The diagram, and the system, are models of reality – they are inherently incomplete and flawed. The map is not the territory! The chart shows two ‘vicious cycles’ shown as A and B on the chart. 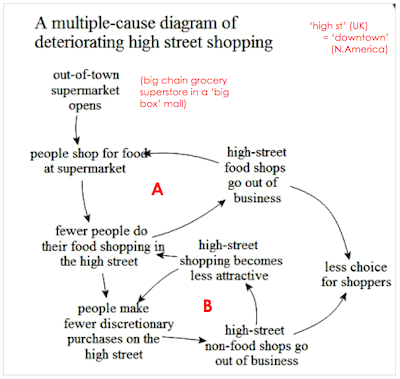 The first of these leads to the bankruptcy of downtown food stores, and the second to the bankruptcy of other downtown stores and the deterioration of the downtown as a whole. 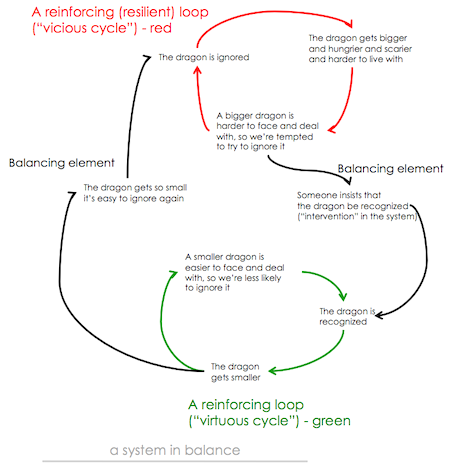 This is a simple example of a system in balance or stasis, where the cycles that might tend to collapse it are held in check. Because it’s a complex system, and we are only identifying the more obvious variables, it’s a delicate balance, and another variable of which we’re unaware, or a “black swan” event, could pull it out of stasis. You could substitute the word “addiction” or “trauma” or “urban decay” or “economic inequality” or “climate change” for “dragon” and the model would still more-or-less work. We discussed the fact that because of oligopolies in the private sector, and because government employees often can’t just leave and find comparable work when their job gets difficult, the kind of ‘market factors’ that might end this vicious cycle and produce a system in stasis just aren’t present. 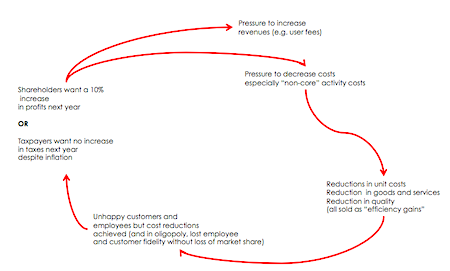 So both sectors add user fees endlessly without improving service, and eliminate or cut back or outsource or offshore services to reduce costs. Customers and employees are both unhappy but have nowhere else to turn in oligopoly markets, so the demanded profit increase and cost cutting are achieved. And since it was achieved, shareholders and citizens believe it can be achieved again each year, and keep demanding it. Such a cycle can only end in collapse. We discussed possible collapse ‘end games’ that could result if this cycle continues — complete privatization of government services, for example, or, to introduce another variable, wide-spread business (government) failure if customers (taxpayers) are no longer able to pay for the industry’s products (their taxes) because of a continuing stagnant economy. We also came up with some imaginative adaptations and workarounds that might pull us out of these cycles (the ones we came up with were industry-specific and not particularly useful to document here). We briefly looked at climate change as another complex predicament, studying the vicious cycles in the systems charts I developed for my SHIFT magazine articles. There was an appreciation, I think, that most of the current “solutions” to climate change (cap-and-trade, carbon taxes, sequestration etc.) can’t be expected to work because they’re defeated by the reinforcing feedback loops in the system, and there was an appreciation of why saying that “if we all just did x it would solve the problem” is mostly wishful thinking, and an improbable way to get out of the predicament. Visualizations, especially other kinds of systems diagrams, such as the famous Lawrence Livermore graphic showing all the sources, uses and losses of energy in the US. Cultural anthropology and specifically ‘business anthropology’ to observe and document behaviours in organizations as they actually occur rather than as the ‘procedure manuals’ say they should. Future state stories to imagine how things might work x years in the future, and then, after collecting current state stories, and engaging a cross section of participating and affected people in iterative conversations, devising a realistic ‘map’ to get to that future state from the current state. Games and simulations and ‘table-top’ exercises to explore more deeply the variables in play in complex systems and how they are correlated, and to envision the impact of attempted interventions, adaptations and ‘black swan’ events. Whole system in the room exercises — that allow multiple perspectives on how the system really functions and what diverse ‘stakeholders’ think would make a difference, leading to some convergence and viewpoint shifts. Biomimicry: the appreciation that nature has been adapting to and working around the predicaments and challenges of complex systems for billions of years, and the value of studying natural systems to appreciate how that has happened. It was a challenging session, and obviously just touched the surface of this difficult subject. I’m grateful that the audience was an exceptionally bright and animated group, and not too large, and would like to thank them for their participation and helpful suggestions. They seemed to appreciate it and find it enlightening, so I may get called upon to talk with others on this subject. I would welcome any thoughts on how to tweak or add to this workshop. This entry was posted in How the World Really Works, Working Smarter. Bookmark the permalink. As I was digesting this, I was thinking about the clinic I am administrator for. It is being specifically developed for patients with complex physical and psychological problems. The medical and mental health communities dreamed it up, the Affordable Care Act is partially funding the innovation model. It involves intensive services of support, motivational work, trust building, inclusion of support system. I was overlaying your model onto the model of care that we are developing, with the mantra of ‘One Size Fits One.’ Very individualized care plans that put the patient’s goals at the center. Really challenging work as most of these patients are so fearful and weary of the current medical system that it takes months for them to open to us, even though we are the last resort for many of them. The creative problem solving that the team does (physicians, medical assistants, nurse care coordinators, community health workers, nutritionists and behavioral health specialists) is phenomenal. When they veer into familiar waters of treating the patient like he/she is something to fix, I gently attempt to steer us back into the wonder of the human being. Your work here with complicated (let’s fix him) vs. complex (let’s honor and admire him) is so pertinent. Thank you, as always. What do you base on the prediction, there will be catastrophic global warming?